In April, 2012, at 9 PM one night we received a call from a contractor working in the City of Gloucester. 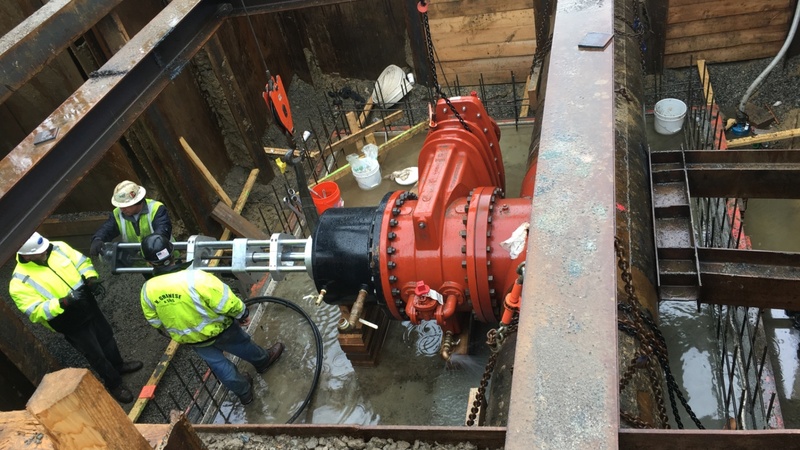 They had inadvertently pulled a 2-inch service out of an old 14-inch cast iron water main that had three 12-inch water mains cross connected in an area of the City which had no shutdown. We were in the middle of another emergency when this call came in. But, by 10 PM the following night, we had one single 14-inch and three 12-inch linestops installed. The entire street was in the process of a full width roadway reconstruction and drain work was being installed when the mishap occurred. So, the water infrastructure replacement was then completed with the linestops in place. Because of a chemical that is added to the drinking water at the Treatment Plant that softens the tubercolation in the pipe, some of the linestops had to be relaxed and reset because the heads would “slip” when the tubercolation would break off. So, SSPLS basically manned the site every day during working hours and retracted linestops as new isolation gate valves were cut in. Seven days later, we finally retracted and installed the completion plug in the last linestop. SSPLS keeps a stock of 14″ – 24″ linestop fittings in stock that includes 18″ for nominal DI/CI pipe so that we can respond to these types of emergencies.